I can order today at a special discounted price! 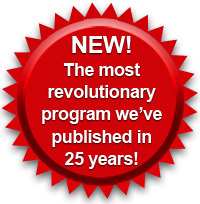 YES, I want to join the Top 2% and begin living a stress-free, unlimited-wealth lifestyle filled with generous giving, abundant happiness, and rich relationships. 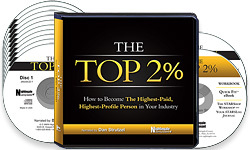 Please send me the 11-CD program The Top 2%: How to become the Highest Paid, Highest Profile Person in Your Industry — along with the writable PDF workbook, Quick Fit eBook, Your STARS Log journal, "Your 2 Minutes to 2 Exercises" bonus CD, and a printed journal — all for just $119.95, which is $30 OFF the regular program price.